In this blog post, we’ll cover two essential aspects of safe and smart testing: lancing and the sufficient test strips to support your diabetes management care plan. Stay sharp with our tips on using your lancing device properly and do the maths to ensure you’re getting the right number of test strips for your needs. Check the depth setting on your lancing device. Maybe the current depth setting isn’t quite right for you. Try dialling a higher number if you need a larger blood drop to do a test. Consider whether you might need to replace your lancing device. Like any device with moving parts, they can wear out over time. 2. Do the maths to get the right number of strips for your needs: Do you feel like you’re constantly requesting more blood glucose test strips because you just don’t get enough at once, or could you practically open your own pharmacy with the number of boxes you’ve stockpiled? Everyone with diabetes should have enough test strips to follow their care team’s recommendations, and it’s wise to have an extra box or two on hand in case you need to test more frequently than usual (illness, stress, etc.). 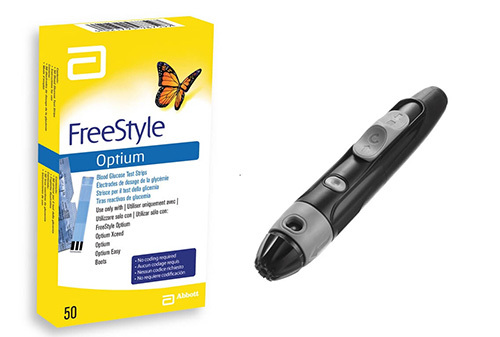 FreeStyle glucose test strips have an expiry date, so it may not be necessary or useful to have a whole shelf full. If you currently have many extra boxes of strips on hand, it’s okay to skip a few repeat prescriptions of strips until you get down to 50 or 100. Your GP should not delete your strips from your repeat prescription list without discussing it with you. If you see a specialist diabetes care team in addition to the GP, ask the specialist team to write to your GP about detailing the number of test strips you should get on repeat prescription to support the care plan they are suggesting. If you’re having trouble getting the number of test strips you need, help is a few clicks away in Diabetes UK’s Advocacy Pack on test strip access. Each lancet needle should be used for only one blood test by one person (never share a lancet needle or your lancing device with someone else). Used needles must not be put in the regular rubbish, so talk with your GP or diabetes care team how you can get a dedicated sharps container for your used lancets. Also ask them what to do with your box when it is full: local policies and procedures for disposing boxes of used sharps may vary.